I had such a horrible night’s sleep last night. I never have a bad night- I lay down and I’m out within a few minutes, often mid sentence while talking to Price. But last night I laid there for what seemed like forever, 1 o’clock rolled around and I’m awake, I woke up several times during the time (no like me) and ta-da the alarm goes off at 5.20 or so for Price to get ready for work. I snoozed until 7 but the alarm every 9 minutes is not a sound sleep and I really wanted to be up at 6 anyway. So I’m off today. But I’m still trying to pull it together by tossing up a blog post. This Sunday I hosted a scrapbooking crop, except last-minute rsvp changes and forgetfulness resulted in a crop of 1. While bummed that I could have slept in and not set up, I spent the day scrapbooking anyway. I got a few layouts done and some in progress, which I having been working on at night now. So the next few posts will be about the scrapbooking I have been getting done. Today’s featured layout was one I did for a photo I took a few weeks back. I have noticed that I have been doing more 1 photo on a 12×12 layout than I did before. I still have my several photos layouts but I have begun to enjoy the 1 photo layout because it gives me more space for embellishment. Anyway, it always gave me a chance to use some cherry paper I just got- def a plus. I used both sides of the patterned paper- 1 side was cherries and the other was definitions. I circled the definition of “Enjoy”. I was definitely enjoying the moment, and my apron! Filed Under: Scrapbooking and Crafts Tagged With: cherries, cosmo cricket, october afternoon, Scrapbooking and Crafts, shabby chic crafts, Stampin' Up! Hope you might be able to squeeze in a nap! Darling layout,perfect for your apron! what a fun layout..I dont think I have ever had an apron, I think Martha Stewart is your real mother. Great job, love those cheeries !!!~! 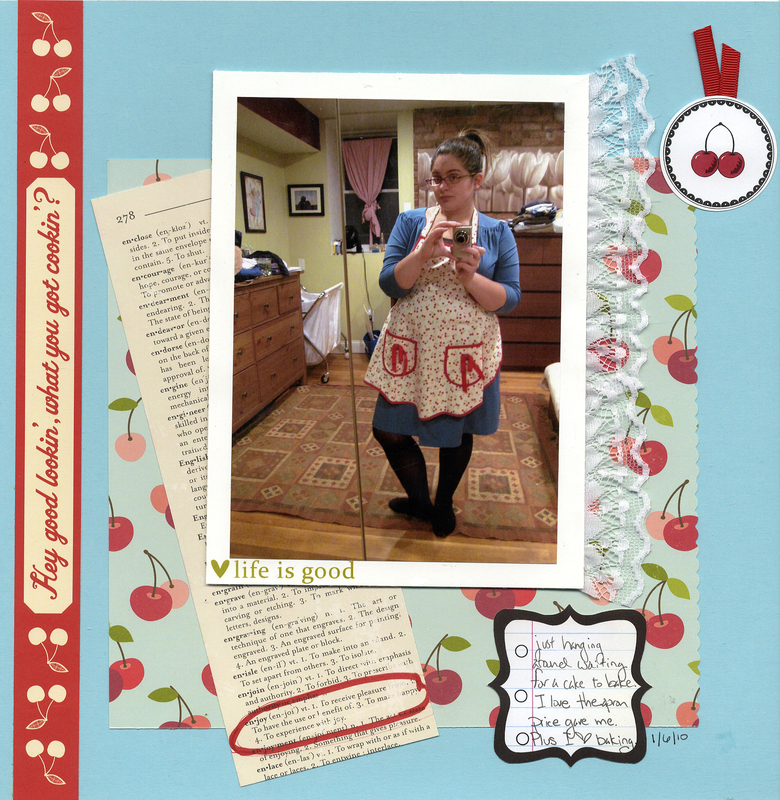 very cute layout & SUPER cute apron!